Overcoming the unimaginable was the theme at the root of David Goldman’s remarkable story and his fight for a father’s right to be reunited with his abducted son, Sean. In 2004, David’s then-wife took their son to Brazil for a brief vacation, but she refused to return starting a complex international custody and abduction battle that took five years until David was reunited with Sean. The case drew worldwide media and political attention. He has also written about the experience in a new book called “A Father’s Love,” which is available at bookstores and online retailers nationwide. You can learn much more about David and Sean’s story by visiting the website BringSeanHome.org. Men’s Rights: Your son, Sean, was 4 at the time he went to Brazil for a supposed vacation and didn’t come back and you were reunited when he was 9 so that was a long time of not seeing your son during what are important formative years for a child. So when you were first reunited, did Sean know that you were his dad? I mean did he understand the gravity of the situation and what had been taking place for half of his life? David Goldman: It wasn’t really clear exactly everything that they were telling him. What we did know for certain was that they tried to erase his real memories and replace them by creating false memories. Essentially they were saying to him that his dad abandoned him, his dad never loved him, he should think of his dad as a bad guy, he’s going to try to rip you away from us and bring you back to a shack or a house that should be essentially condemned. A lot of awful things were said that amount to parental alienation, as I’m sure you’re aware of and your listeners are aware of. So, that just seared right through my heart. But, my only answer was again, as always, the truth, but this time the truth to a child meaning that I explained to him that I’ve been down there several times with his grandma, his grandpa, his cousins, and other family members and friends always trying to see and be with him. Men’s Rights: Were you expecting that reaction when you first saw him? Did you think he’d run into your arms or did you think in the back of your mind he might think he’d been alienated? David Goldman: I was expecting anything. I was very concerned and feared the worst — that he might be pushed up the stairs to come and see me on the platform where I was waiting for him with a little table and chair, but I was hoping for the best. Men’s Rights: You mentioned, and as we probably expected in a situation like that, there was some form of parental alienation going on. How have you guys been able to overcome that, or have you? David Goldman: I guess we have to keep trying to show him things or telling him what they said wasn’t true because just being there together, being back home was his biggest conflict. And that really, really made a difference. Rather than just sitting him down and trying to explain things I just let love, passion, compassion, and understanding speak for itself. Men’s Rights: You were reunited Christmas Eve 2009 so it’s been about a year and a half. What’s life like for you guys now? Is everything back to normal? David Goldman: Well, it’s getting up in the morning and getting ready for school. He pours his bowl of cereal, I’ll make him lunch, and we’ll get him off to school. Then we’ll come back and do homework and he’s even playing little league baseball now. It’s really, really a miracle. Men’s Rights: Your book as I mentioned is on sale and is called “A Father’s Love.” What are you hoping people get out of this book and your experience? David Goldman: At the root of it, it is overcoming the unimaginable. The things that we had to go through and the hoops that we had to jump through to be able to be reunited and to be able to be a father and son again should be so simple. Hopefully this will give folks in a similar situation, as well as folks battling all sorts of different things, that by sticking with the truth and persevering, you will come out on the right end of things. Don’t give up and don’t give up hope even if it dwindles down to the most minute shape of hope, you can’t give up. Also, there are some chapters and parts in the book that tell some things that haven’t been disclosed in the media and the news. For example, one morning I’m working and I get a phone call. The next day I’m in D.C. in the National Security Council with those folks that everyone saw from those images when Bin Laden was shot. Well, we were right up there speaking to President Obama’s Security Council on his first meeting with Brazil’s President Lula and how they were going to bring up my son’s abduction. We also have a chapter dedicated to other families who are living this tragic nightmare. We need to have a lot more help from our government and raise awareness on this issue to get some legislation passed. Our children are the most vulnerable and innocent among us and we have to do more to help them to not have to live in these hostage situations. 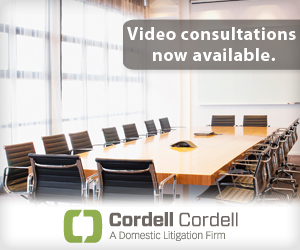 If you find yourself in the midst of a child custody battle, contact the Cordell & Cordell Law Firm or read the divorce resources available at DadsDivorce.com.